I think both of these sets of data don't paint a pretty picture for the future of MS. We never truly recovered from the early 2012 crash according to this data, but we are also at an all time low. I think we are at a point where it's not to late to change things, but identifying the problem is quite difficult. There are a number of possibilities that I see; It could be that forum's are a dying medium; it could be that mafia is a dying game; it could be that MS just no longer caters to the tastes of people that play mafia; perhaps MS isn't getting it's name out there like it once did. If forum's are just dying, I'm not sure we can do anything. I mean short of creating a mafia community based around a facebook plugin or something. I take issue with the idea that mafia is a dying game, board games are doing better than ever, and I feel like mafia should be caught in that upswing. MS has always taken the meltingpot approach to multiculturalism if you will. We force everyone to play the same way. I think that way has become increasingly divergent from how mafia is played elsewhere. That we are a meltingpot is a natural byproduct of our queue structure. Everyone only has access to so many games at a given time so they all need to have a wide appeal. I think we need to seriously consider redesigning how games go through signups to allow for more niche subtypes. Continuing to just further divide the queue's isn't enough. Is our wiki no longer sufficient for attracting new people? Has MBF's flash finally died out? Perhaps more people look to twitch these days for games. A lot of work has been getting done to the wiki recently, and I don't know how to make it more accessible, but I've talked about creating a new interactive game introduction tool as a form of advertising for MS for a long time. It's possible we need it now more than ever. Also I know some people stream mafia games on twitch, perhaps we could try to get a weekly group together to do the same. I look forward to hearing what other people have to say about this, especially our newest users. I think it probably has to do with an age dynamic. I think most of the MS users are late-teen to late-twenties. We're looking at the fact that we have a new generation that handles things differently. Teenagers I meet now have no clue what a forum is... they use reddit, maybe, but they use Tumblr, Facebook, Instagram, and Twitter. MS wasn't born in the time of social media dominance that we now experience. Forums seem outdated. I can trace this to other things, too. Forums were huge when I was in high school. Now, I go and visit some of my old forums, and it's not just MS that's down in the dumps, it's all of them. We're probably just seeing a shift in communications mediums. AIM died out a long time ago and MS users still use it... now, FB Messenger is dominant. That's not to say we can't adapt. The sitechat idea was a great one and projects like that will continue to do well. I don't think the popularity of tabletop gaming correlates to what we do. I have plenty of RL friends I've gotten into mafia but they have no desire to use the forums. Was I incorrect in assuming EpicMafia is dying as well? I have no idea how epicmafia is doing. It could also be that mafiascum screams Web 1.0 in a way which communicates neither trustworthiness nor intimacy. What your analysis doesn't consider is mafiascum's market share. It's my understanding that Mafia is continuing to spread throughout the Internet, but as a byproduct of that, that means that they're not playing it here. It used to be that people tried to play Mafia offsite, and then were redirected here because that's where their moderator learned it. Now there are mega-forums with established Mafia populations who don't need to hold this site and its wiki up as examples of how to play. If we knew how many people were actively playing Mafia here versus other large sites and large Mafia populations, and learning what they're doing differently or what pool of potential players they're drawing from, etc. One interesting side note is that it's not very easy to get a Mafia population started - many attempts on non-dedicated boards fizzle after a few games, or don't get larger than a handful of people. Following from that, I'm curious to know how and how much the post-forum generation plays Mafia. It's not really a tumblr/Twitter kind of game, though it does work in chat rooms (what? chat rooms?! that is so AOL) and it does work face-to-face (see: board games thriving). If our site population is squeezed between old people who no longer have the time to play and/or can't deal with the accelerating meta (e.g. me) and young people who wouldn't join the forum to start with, then etc. I don't think that trying to accommodate different playstyles with unique games per queue will work. Doing so assumes a critical mass of people per playstyle who would play games specifically because it caters to them, rather than just playing a one-off as a novelty. Between the ISO feature, Private Topics, and our ability to have 100 games running at once, we're pretty far ahead of almost every other site in re: being able to host Mafia games; so I don't think it's that we're incapable of hosting the world's Mafia population. MBF's flash was outdated years ago; no one seems to see it but me. <_< I know that we no longer have the only Mafia wiki out there, and that it's not necessarily the dominant Mafia wiki in some circles. It's my understanding that our Mafia wiki hasn't been updated all that much since the last time I burned days of my life on it in 2010, but it's not like a whole lot has changed anyway except our own site's policy (which outsiders wouldn't care much about). This just ties back to my first point - that mafiascum no longer provides exclusive access to Mafia. Even if our wiki were made of Internet gold bricks, A) the only people who are interested in our wiki are people who are already playing Mafia, and B) those people have more options than just us if they want a non-amateur Mafia experience. Competition, etc. I do like the second half of your advertising post, though that also ties into market research. The best way to find out where Mafia's future is is to go find some young people who don't play, get it going face-to-face, and then see how they'd continue playing it later with their friends. Since it doesn't fit the dominant media of today, chances are the answer will be "face-to-face", and forums may not even be thought of. If that's the case, well, best enjoy this place now. In post 4, Quilford wrote: It could also be that mafiascum screams Web 1.0 in a way which communicates neither trustworthiness nor intimacy. I really think a new design would go a long way. It's not a complete redesign, but the header is by far the most Web 1.0-ish. No. It's far too time consuming to produce designs for phpBB, and far too frustrating to actually implement them. I'm simply pointing out that to a guest, ms.net looks like a default forum with only a few trivial changes. You can read any article on how to make a website look trustworthy and the key is always to have a good-looking design, because it signals that someone is investing time, effort and energy. Certainly a start would be making springlullaby's crisp, innovative logo standard issue across all themes/styles/whatever phpBB terms them. Thoughts on just making mafblack default? Yeah, the default skin for the forum and picture are really off putting. As for the wiki attracting attention I could think of some ideas which could improve it heavily, starting with a custom default skin. I would start looking into coding it myself however my PC is dead as dead can be and I can't afford another. I'm also 15, however forums seem to be a dying thing among peers. I don't know how to attract more peeps. At a start, I'd think it would be beneficial to just drop Spring's logo on the default and sepia skins. I don't imagine that would be a terrible amount of effort. A full re-skin, though? 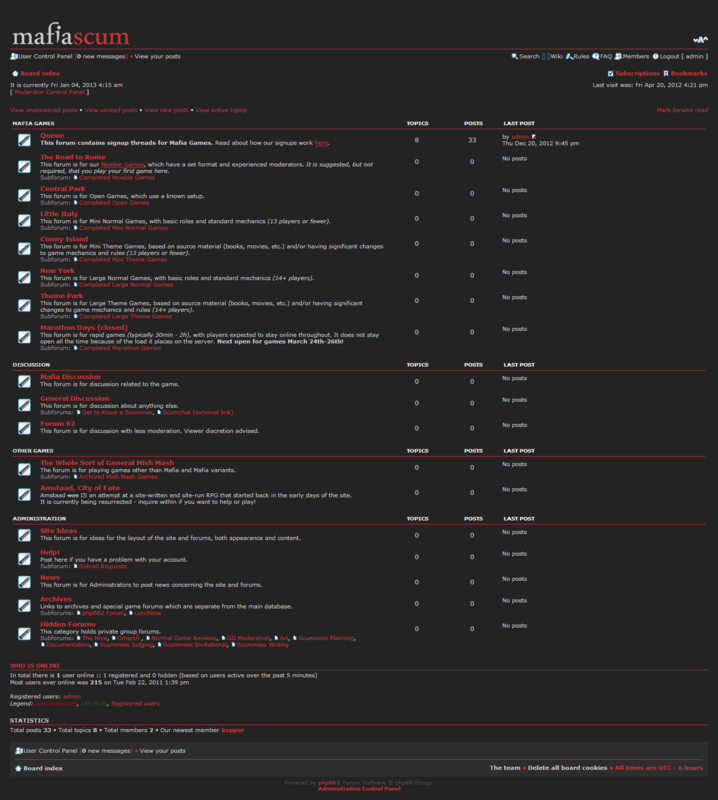 Even if I had the phpBB knowledge, I wouldn't have any ideas on how to make a forum look less... well, forum-y. I don't really know why it wasn't done initially. I assume there was some sort of hold up by flay or mith? I don't think things are PANIC! bad. I do think they are at 'we clearly need to change course' bad though. Let's not let ourselves run into the iceburg. In post 11, chamber wrote: Thoughts on just making mafblack default? I think it would look a lot nicer if you imbued some red/dark red tones. The furthest I ever got working towards that was this. It was never shown outside of the Art forum, though, and UberNinja started making his own dark theme, so I lost interest after a while. I think it still looks pretty decent, especially as modern UI design trends more and more towards a typography-oriented, flat-colour approach. White-on-black designs are pretty annoying. In post 20, Bicephalous Bob wrote: White-on-black designs are pretty annoying. That's exactly the approach I took in the design I linked in #19. If there was support for it, I'd try working towards it again. Also VI, the wiki is outdated hence I'm trying to update it. Once resorting and updating info like "Games Played" is out the way I can hunt for people to make articles on meta now, update and discuss role balance and all that stuff. Chamber is like a tech admin isn't he though? If so then I can suggest some changes to some of the exstensions and the likes. hmm, it's way better than the current MafBlack, but I don't think I'm the only one who dislikes reading loads of white text on a black background. I think you have a bigger chance to get your design to be the standard if you start with a black-on-white design. I think something like that would be nice, though I think there's a bit of a lack of structure there. Might look better in a non-black color scheme though.